You have a committed group of fundraisers ready to raise money for your nonprofit. You’ve shared your organization’s campaign language, key metrics, and impact collateral so they’re well-equipped to educate their friends and family on your mission. You instruct them to set up a personal fundraising page on Classy, and they’re ready to raise dollars. But your training effort shouldn’t stop there. 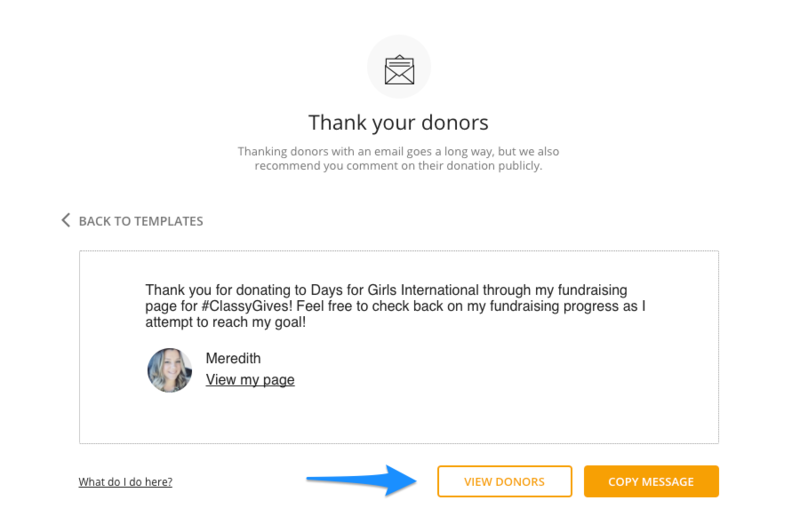 To make sure your fundraisers are set up for success, we rounded up a few features on the Classy platform that they should be aware of in order to maximize their efforts. Send along these tips to your fundraisers and staff to demonstrate all the ways that they can customize their personal fundraising pages to captivate their networks, engage with supporters, and attract donations. This one seems straightforward, but it’s first on the list for a reason. So many fundraisers don’t take advantage of this feature, but as storytelling is critical to successful fundraising, your fundraisers should be sharing how their personal story fits into your organization’s larger one. 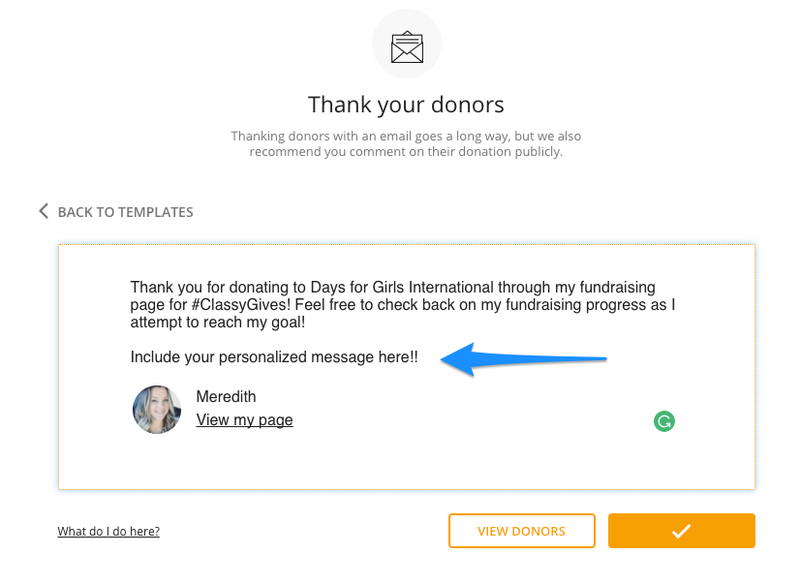 Here’s an example of an update that checks a few boxes at once: timeline reminder, thanking donors, individual progress update, and two inline links to the overarching campaign (#ClassyGives) as well as the website for the organization (Days for Girls). A timely thank you after a donation is one of the most important interactions fundraisers will have with their donors. When you show gratitude and appreciation for a donor’s gift, you give donors a feeling of recognition and goodwill—which are the warm, fuzzy feelings that encourage people to give again. On Classy, your fundraisers can always make sure they’ve thanked each of their donors. 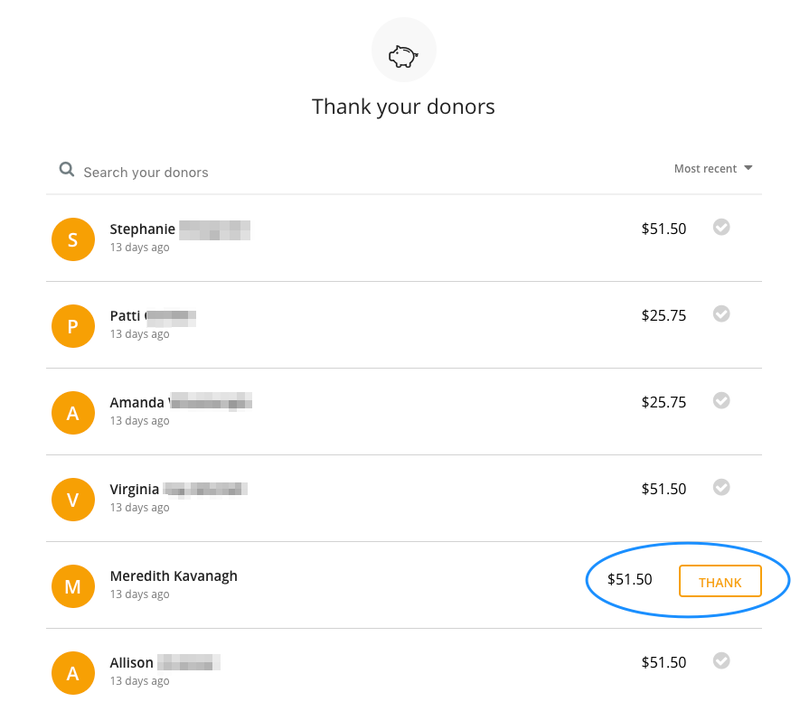 Instruct them to navigate to the donations tab on the fundraiser dashboard where they’ll see a list of donors along with the amount of their donation. To the right, there is either a grey check mark or a button that says “THANK.” If you see the “THANK” button, that means you haven’t replied to that donation on the activity feed. Now, fundraisers can make sure they reply to everyone. An added bonus on this tab is that if you hover over the donor’s name you get a preview of your thank you message. 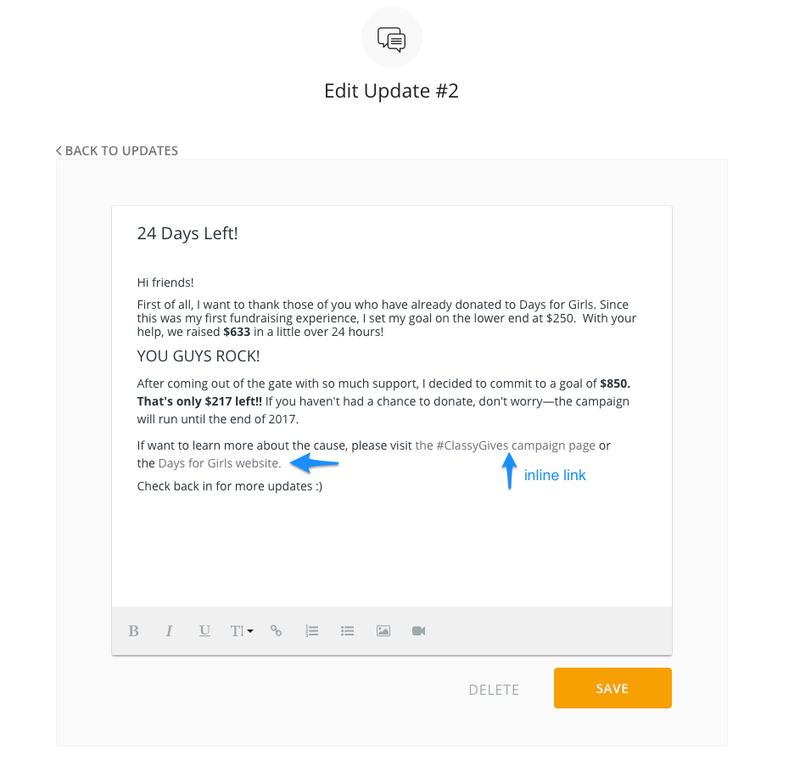 Thanking donors on the activity tab is a great way to engage them in real time and show that they’re connected to their fundraising efforts, but to further show their appreciation, they should send an individualized thank you message via snail mail or email. When a handwritten card isn’t feasible, a personal email demonstrates your gratitude and is easier to execute. To make things even simpler, Classy includes a thank you template in the dashboard. Your fundraisers will thank you for sharing these steps and screenshots so they feel prepared to steward their donors. Notice that the template is short and sweet, so encourage your fundraisers to add their own sentiments. 1. Go to the email tab in your dashboard and click on the thank your donors option. 2. Add a personal touch to the templated message and then click the checkmark to save. 3. Once you save your message, the checkmark button will say “Copy Message.” Click to copy the message and then paste it into a new email. 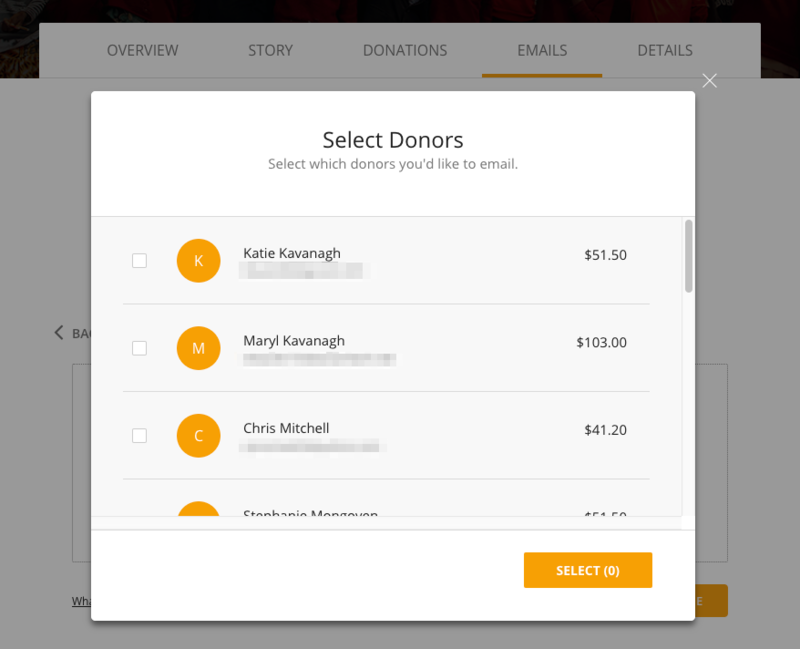 Next, pull a list of your donor email addresses by clicking on the “View Donors” button below your template. 4. 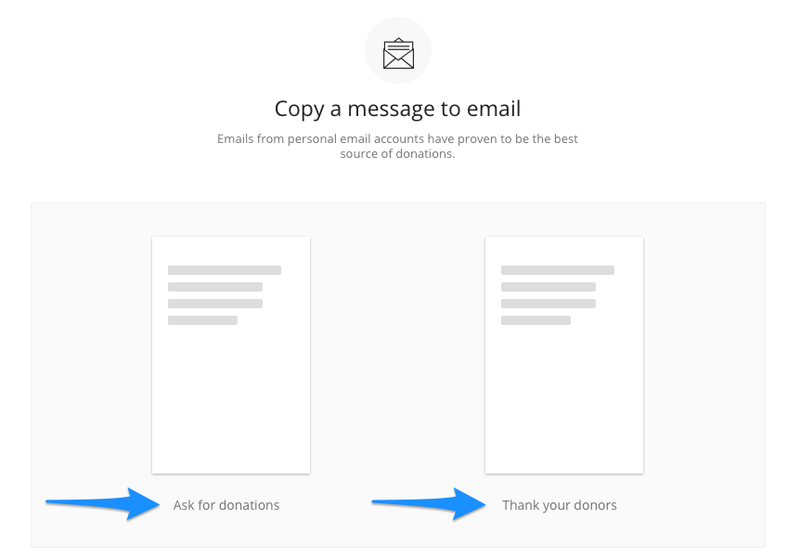 Check the box on the left to select which donors you want to email and press the “Select” button. 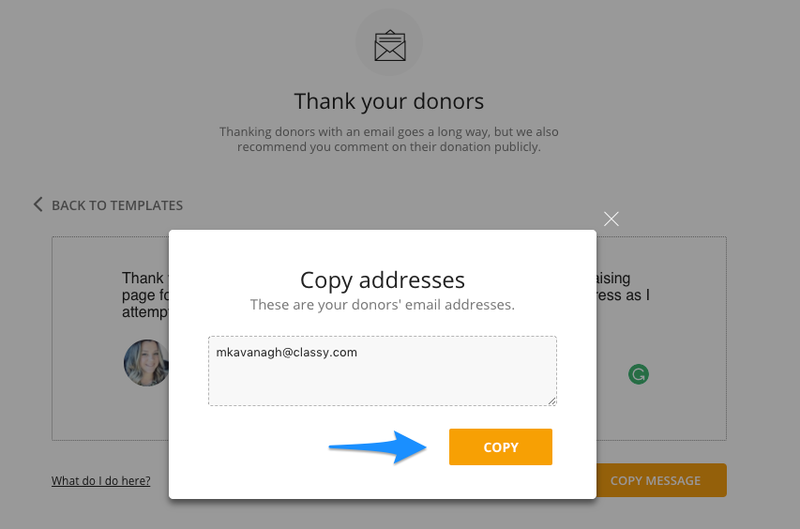 Once you do this, you’ll see a window with email addresses for the selected donors and all you need to do is copy and paste into your email browser. Include a short message, quote, or call to action that will capture the attention of potential donors. To do this, simply click on the details tab and edit your Page Headline. Call out to fundraisers that they only have 180 characters, so make them count! Everyone wants to know that their donation makes a difference, and there is something so exciting about making the donation that pushes a campaign over the finish line. In fact, the goal proximity effect says that people are more likely to donate when a campaign is close to hitting its goal, so make sure that your fundraisers are sharing their goal progress with supporters. To make a goal seem more attainable you can break it down into daily donations. Although it’s the same amount of money, raising $10 a day sounds more manageable than raising $217. If math isn’t your strong suit, then don’t worry, Classy has your back. At the bottom of the Overview tab on the dashboard, there’s a chart to track donations made over the last five days. Here your fundraisers can see the total number of donations, average gift amount, and how much is needed to raise per day to reach the goal. Here at Classy we’re always working to mobilize and empower the world for good, and we share your appreciation for time-saving tools that allow you to do good in the most efficient way possible. Share these features and tips with your network of fundraisers to help them reach more donors and in turn, help your nonprofit make a difference.